Note: This is a companion piece to Paste’s just-published blind tasting and ranking of 324 American IPAs. Way back in 2014, I went on a beer trip up and down the front range of the Rocky Mountains. Hopping from location to location in cities such as Boulder, Denver and Fort Collins, I sampled the wares of a new generation of breweries that had sprung up throughout Colorado in the early 2010’s. And one of the more memorable experiences from that trip was a stop at Denver’s TRVE Brewing Co., itself a new kid on the block at the time. That transition is the perfect encapsulation of how fast styles change and evolve in the modern craft landscape, and the pace of change and adaptation has only grown more rapid since 2014. Four years? That’s an eternity in modern beer. Current trends in the the beer market go from “nascent” to “oversaturated” in mere months rather than years. Just look at “brut IPA,” a term that no one outside of San Francisco had heard only a few months ago. If it’s the latest IPA substyle anointed with “next big thing” status by enough breweries, we could be completely inundated with brut IPAs from major regional and national craft breweries by the end of 2018. You’d be drinking Samuel Adams Brut IPA by next spring, already sick of the fad. Which brings us to the elephant in the room, and my real subject for this piece, which is India pale ale. Suffice to say, after the massive blind tasting and ranking we just finished of 324 IPAs, we’re never going to be in a better mindset to talk about exactly what is going on in the style than we are right now. Because when you sample 324 different beers over the course of 17 days of tasting, you learn some stuff about the style you’re drinking. And that certainly happened here. On some level, I feel like this ended up being the perfect moment to conduct a new blind tasting of American IPAs—to assess what is working, and what is not. The modern IPA market is an arena with a little bit of everything. Hazy/NE-IPA has of course come to dominate the beer geek attention cycle, along with the upper echelons of rating sites such as BeerAdvocate or Untappd. If 2017 was the year that hazy IPA hit the mainstream thanks to the likes of Sam Adams and Sierra Nevada, then 2018 was the year they’ve become completely ubiquitous. But at the same time, it’s not as if there isn’t a ton of other IPA out there, and those other, non-hazy IPAs still account for a whole lot of sales. It may feel like hazy IPA has completely taken over the segment, but any beer store with a wide selection is still going to be carrying crystal clear, bitter, West Coast IPAs as well. Look harder, and you’ll even find some malt-forward IPAs in the mix, along with a smattering of niche selections. You’ll find some wild IPAs with brettanomyces. You’ll find some fruited examples, and some spiced examples. You might find some bleeding edge stuff, like the aforementioned brut IPA. And of course, you’ll find IPAs that blur the lines between distinct substyles—clear IPAs with modern, “juicy” flavor profiles, and vice versa. To act as if the entire IPA segment has been taken over by a single fad at any given time is a gross overgeneralization. So let’s ask ourselves some very basic questions of what it means to label your beer as “IPA” today, what the consumer should be expecting when they see it, and what separates (in our minds) good modern IPA from bad modern IPA. To help us answer some of these questions, I enlisted the help of two brewers who I would consider experts or masters of the modern IPA field—both of whom produced IPAs that finished in the top 3 out of the 324 that we tasted. One, James Dugan of Great Notion Brewing, is producing some of the field’s most sought-after hazy IPAs from the hoppy hotbed that is Portland, OR. The other, Evan Price of California’s very young Green Cheek Beer Co., is the brewer of the tasting’s highest-ranked clear IPA, a beer that also just won a silver medal at the World Beer Cup only months ago. Together, these two brewers represent the cutting edge of both hazy and clear IPA brewing. Portland’s Great Notion Brewing produced the #1 IPA in Paste’s blind tasting of 324. What do good IPAs do right? For the purposes of this piece, let’s assume that most of us have a pretty good idea at this point of what makes for a good non-hazy IPA. At least some level of bitterness is expected, although perhaps less than what would have been seen as the norm five or 10 years ago. Hop flavor is paramount, but there are still examples out there that favor a substantial malt balance as well. The evolution of the style, though, has largely been driven by the availability of new hop varietals—it was the flavors that brewers could suddenly wring out of the likes of Citra, Mosaic and Galaxy that changed the IPA market more than anything, before hazy examples started proliferating everywhere. Hazy IPA simply came to be because a number of breweries realized that the natural haze brought on by extreme dry-hopping and a lack of filtering went hand-in-hand with dynamic hop flavors. Sure, this seems like the most obvious statement of all, but it’s true. Hazy IPAs work best when they’re hop delivery vehicles. This isn’t saying that there’s no room for malt balance in a good NE-IPA, as we tasted more than a few in the 324 that made this work, but the best are almost invariably on the subtle side, malt-wise.There’s something distinctly off-putting about hazy IPAs that have been made turbid in appearance, but lack assertive hop flavors—it draws attention to all the aspects of the beer that you probably don’t want attention for, and all the downsides of turbidity. What does this mean? The word “soft” is often used, and we would agree—the best NE-IPAs are very smooth and perhaps a little slick, with a mouthfeel that is full but not overbearing. “Chewy” is a term that is somewhat contentious here—there is a certain subset of DDH and quad-hopped IPAs that are seeking “maximum chewiness” to the detriment of all else, and these beers just don’t work for us. As becomes a theme in hazy IPA, there’s a tipping point in play: Up to a certain point, fullness of body makes for a beer whose texture is perceived as smooth, creamy, and even possibly refreshing, although that isn’t a natural feature of NE-IPA. But once you cross that tipping point, the texture turns gritty and unpleasant. Make no mistake, NE-IPAs can get overly sweet very quickly, but the style itself almost demands at least a minimal level of residual sweetness in order to make those sought-after “juicy” impressions seem more vital and genuine. This is perhaps the most important thing that all the best hazy IPAs that we blind-tasted shared in common, and although it’s entirely subjective, I truly believe that sheer hop rate and particularly the amount of hop particulate (and yeast) in suspension is the biggest factor in determining whether or not we enjoyed those IPAs. Once again, it’s the tipping point: Up to a certain level, all the Citra and Mosaic you’re dumping in is primarily contributing bright, juicy flavors. But after a certain level, things change. Let’s talk about that now. What do bad IPAs do wrong? A lovely hazy IPA from Green Cheek. Sure, some of the sought-after varietals are harder to get than others, but if all you can get is Chinook or Summit or Columbus, you might want to make something other than hazy IPA with it. Just sayin’. Residual sweetness is something that needs to find a reasonable balance in any NE-IPA, but some breweries look at the style as an invitation to make straight up sugar bombs. We can exclude “milkshake IPA” from this conversation, as that substyle, for better or worse, is meant to be dessert-like. But the number of regular hazy IPAs we sampled while blind-tasting the 324 that were saccharine in their sweetness was absurd—we had beers that tasted like they’d just had a shot of simple syrup added after canning. It’s understandable why breweries make them this way—American consumers love sugar, but hate to admit that they love it—but overly sweet NE-IPAs are an easy way to ruin the beautiful balance the style is capable of having, not to mention making these beers very difficult to drink in quantity. If an IPA is too sweet to consume 12 oz at a time, something is wrong. This should also go without saying, but many of the worst NE-IPAs also happen to be ugly as sin. And the reasons why go hand in hand. Put too much yeast in suspension? It’s going to look like sewage water. Compare a bad NE-IPA to a great one, and the great one is almost always the beer that looks more aesthetically appealing, and it’s because that brewery knows what it’s doing. Pour out an IPA from Tree House and what you’ll get is something luminous and beautiful, a hazy golden beer that looks like it’s glowing in the glass. The worst ones? They have a tendency to look like something that backed up out of your sink. No one wants to drink a beer that looks like this; even those of us who love hazy IPA as a style. Can clear and hazy IPA coexist? In short: Absolutely, clear and hazy IPA should continue to coexist alongside each other, and anyone who claims or implies that one should/will replace the other is likely either concern trolling or just plain ignorant. The consumers who developed a taste for IPA in the 1990s or 2000s and have been faithfully drinking it for 20 years aren’t about to suddenly stop enjoying the dry, bitter flavor profile that they’ve known and loved for decades. 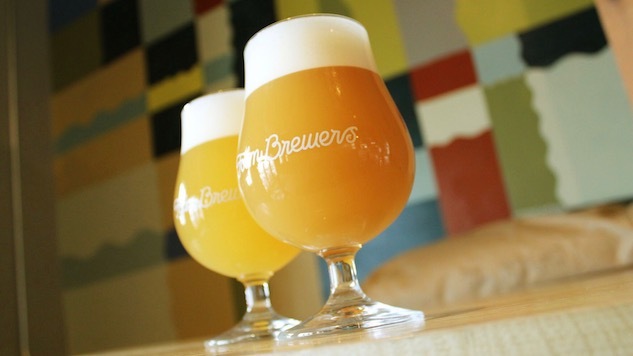 Likewise, the newer drinkers brought into the style for the first time by friendly, less bitter, sweeter, fruit-forward hazy IPAs will likely find their way back to the older style with time. These things are cyclical, as tastes explode into popularity, fade away and return again. And it’s crazy to act as if consumers drink only one style or the other—many beer geeks, myself included, want access to both clear and hazy IPAs on a daily basis. The more choices we have, the better. Exemplary hazy and clear IPAs both performed well in Paste’s blind tasting. The reality is that breweries must simply balance demand and current consumer tastes with how they choose to market their beer portfolios. Or in other words, you can still make malty, amber beer if you want to. You can even hop that beer fairly assertively, or dial up its bitterness. But before you go and label that beer as your “IPA,” realize that you’ll be fighting an uphill battle in asking the consumer to judge that beer as India pale ale, in a time when beer drinkers have come to consider “IPA” a term that implies assertive, hop-forward flavors and less bitterness than was once common. In fact, if your beer is malt-forward, amber and markedly bitter, perhaps consider calling it something other than IPA—it might even be better received that way, when it’s not being compared to the latest hazy, juicy beer on the block. In the end, India pale ale remains the most popular and widely sold beer style within the craft beer sector, and this isn’t about to change anytime soon. Ever since IPA surpassed pale ale to become the standard-bearer of the American craft beer movement, it has been new developments in hoppy beer that have inspired growth and change in the craft beer industry as a whole. Not every development or craze has led IPA in a positive direction, but hopefully breweries will learn from some of the industry’s less-pleasant fads and emerge with stronger overall portfolios … be they clear, hazy or otherwise. If we can ask just one favor, though: Please, no more IPAs that look like they were siphoned directly off the yeast cake at the bottom of a fermenter. We’ll all be better off without drinking something that may or may not be a glass of pond water. Jim Vorel is a Paste staff writer and resident craft beer guru. You can follow him on Twitter for much more drinks writing.